- I’ve always had issues with the monopolization of industries in our world. I hate that huge cable and telecommunication companies can merge and own over half the business in the world while pushing out small business. This, to me, is the seedy and pure dark side of capitalism. Don’t even get me started on the current state of Net Neutrality, the corrupt politicians who greased those wheels to repeal it. 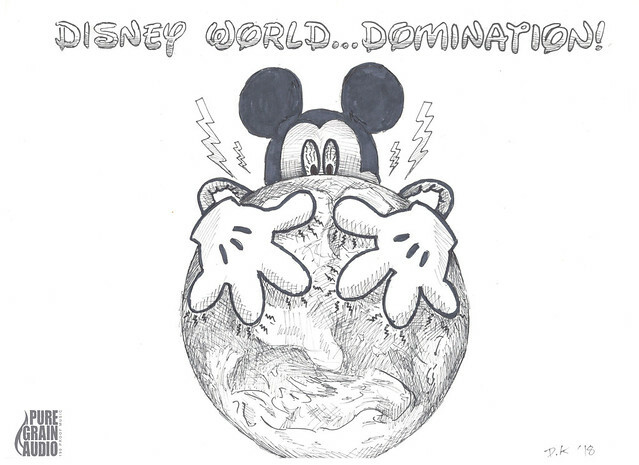 When the ink dries on the sale of 20th Century Fox to Disney, Mickey Mouse will control 60% of the movie industry. That is insane! Good luck to those small, one-screen movie theaters in small towns. Disney requires that their films be on those movie screens for at least a 4-week period. With them owning over half of the popular movies audiences go to see, I wouldn’t be surprised if this is the nail in the coffin of small town theaters. Who can afford to keep that one, same movie on that screen in that small town, long after everyone has seen it? Check out the full-resolution version of the PENsive #5 sketch. Disney also isn’t immune from being swayed by politics and, at the same time, has tried to fashion themselves as “decency police”. They just fired Director James Gunn from the 3rd instalment of Guardians of the Galaxy, the franchise he developed with his own creativity and vision (and would not be half as good without him). Fired for Tweets he made (and apologized for) 7-8 years ago. What he joked about in those Tweets was disgusting, but he owned up to being embarrassed and ashamed for his prior “humor” and has since grown up in the last 7-8 years. He didn’t send these Tweets/jokes while being employed at Disney (as Roseanne Barr Tweeted racist comments while employed at ABC), but did so years earlier. These were dredged up from the past by a right-wing commentator as retaliation criticism he received from Mr. Gunn. Now, everyone is deleting their Twitter accounts. Check out this video of 10 painfully racist moments in Disney movies.